Once again Daniel. Thank you for your inspiring work pushing an important agenda. I hope you get some time to relax with a bit less PTUA pressure! All PT users should be grateful for your many years of constructive and productive work developing sensible policy, disseminating useful information and lobbying government on inportant issues. Thank you! There are many ways to bring about change. You took a steady and persistent lobbying path. I don’t recall you ever calling a transport minister an effwit or a liar. You were always very reasonable and never personal. You stayed on the message and no doubt respective ministers, their minions, transport bosses and the media found you very pleasant to deal with. You worked within the system and effectively. But I will say, sometimes I wish there was some passion and anger, an alternate lobby group perhaps. I suppose there was at times, but they burnt out. As I said in the past, big shoes to fill for the newcomer, and I hope your replacement is not judged too quickly by the standards you have set but given time to find his or her own feet. 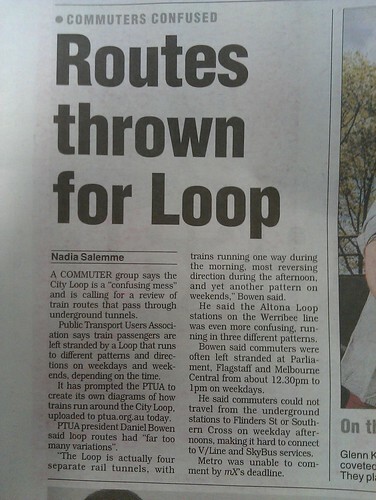 PS, I did not realise what a nightmare the city loop was until I saw the ‘helpful’ diagrams. Daniel – congratulations on your nine years of service and your success in helping to broaden the agenda from purely infrastructure to service as well. You should also be proud of how somewhere along the way you grew in the role to be seen as offering a distinctive, constructive and valid approach in a style different to (but no less effective) than pevious presidents. Enjoy your return to private life and best wishes to your successor, Tony.